Chipotle has an impressive run-up in share price driven by a promising business transformation led by new CEO Brian Niccol and his new executive team. Though investors can still be optimistic about Chipotle's future growth prospect, there are reasons to dial down the expectation. Along with the concern on its rich valuation, a few other factors may be equally worth investors' attention. Considering these factors, Chipotle investors should reevaluate their investment plans based on their investment objectives and portfolio strategies. 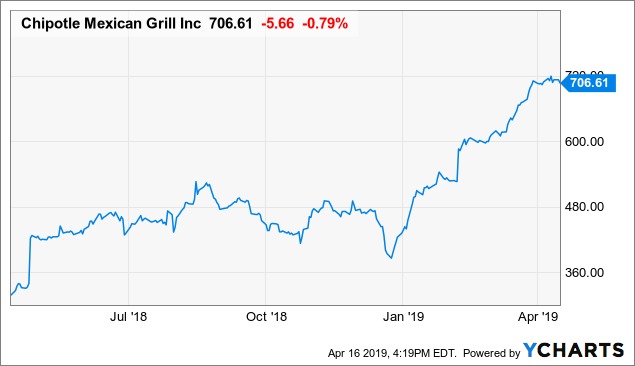 I have been following Chipotle's (CMG) turnaround story and have been impressed by new CEO Brian Niccol's ability to quickly change the market sentiment on Chipotle's growth prospect. Since Niccol joined Chipotle in March 2018, Chipotle's share has been rising like a rocket ship, particularly during 1Q 2019 when it rose another 60%. It is understandable that the market is excited about a good business transformation story and encouraged by the promising early results. However, investment is mostly about looking forward. Can Chipotle continue to deliver an explosive return of value to its investors? In this article, I will explore several factors that Chipotle's investors should concern about, potentially leading them to reset expectation. No doubt Chipotle's new growth strategy, which is centered around using digital innovations and creative marketing to drive up same restaurant transaction volume and sales, has been effective, reflected in its overall improved operating and financial results. 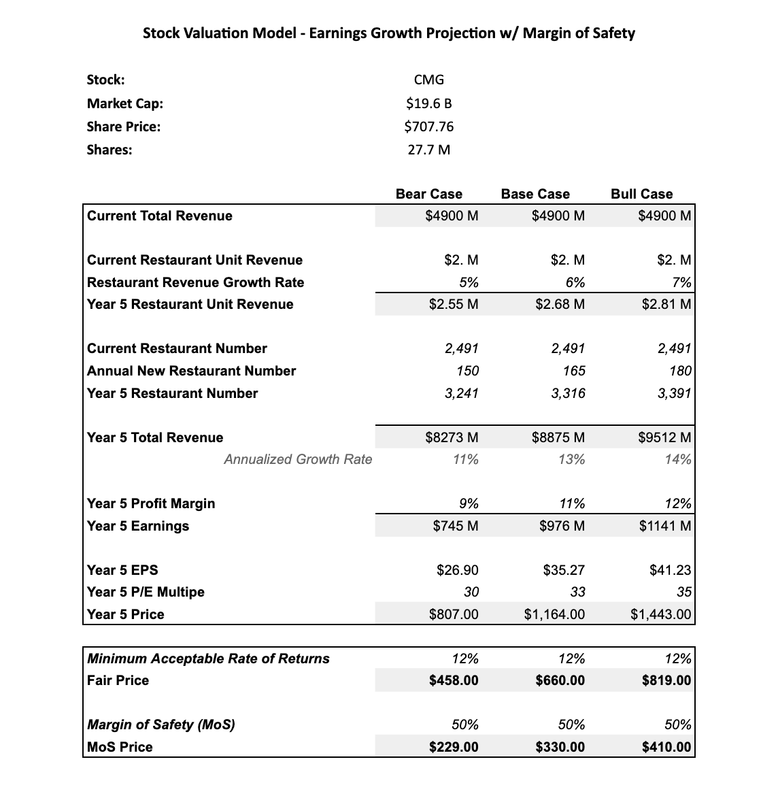 According to the company's recent proxy statement, the implementation of these initiatives has led to substantial year-over-year increases across several key metrics: (1) Revenue increased 8.7% to $4.9 billion; (2) Comparable restaurant sales increased by 4%; (3) Digital sales increased 42.4% and accounted for 10.9% of total sales; and (4) Restaurant level operating margin increased to 18.7% from 16.9%. All these growth initiatives are logical and obvious options to transform the business by taking advantage of Niccol's extensive experience in digital innovation and brand building. These are powerful growth drivers and should sustain a multi-year growth span for Chipotle being still at the early stage of their implementation. Hence, it is reasonable to expect Chipotle to continue to grow at a reasonable pace. Now, the remaining question is what else Chipotle can do to further expand its business and drum up the excitement for its business prospect. Should investors pay for the premium already built into its current price? The truth is Chipotle, similar to other restaurant businesses, can grow by two main levers, increasing same-restaurant sales and opening more restaurants. Arguably, Chipotle has already taken advantage of many of the obvious options for near-term growth, leaving it with the less certain options for future long-term growth. Most of Chipotle's current transformation efforts, including new menu items, marketing campaigns, mobile app, pick-up, delivery, drive-through, loyalty program, and more aim at sending more traffic through each restaurant to maximize its capacity and drive up total same-restaurant sales. Some of the efforts, such as improving the main make-line operating efficiency, adding the second make-line, and adding pick-up and drive-through capability, have expanded its restaurant capacity, allowing it to serve more customers and generating more sales volumes at the same restaurant as a result. But sooner or later, each restaurant will reach its capacity for peak hours. That will leave Chipotle with the option to try to bring more traffic during the off-peak hours, which is why Chipotle has been experimenting with happy hour promotions. Transforming off-peak hour business, including the potential of adding breakfast, will likely be more challenging and full of uncertainty because it is hard to change restaurant-goers' established behaviors. There is a good chance that these efforts may end up with minimal impact on Chipotle's overall sales and profitability. According to 2018 QSR Magazine Top 50 Report, which reports the top 50 restaurant chains' sales numbers, average restaurant unit sales topped out at about $2.5-2.8M for most of the top restaurant chains, with the privately held Chick-fil-A being an outlier at $4M per restaurant. 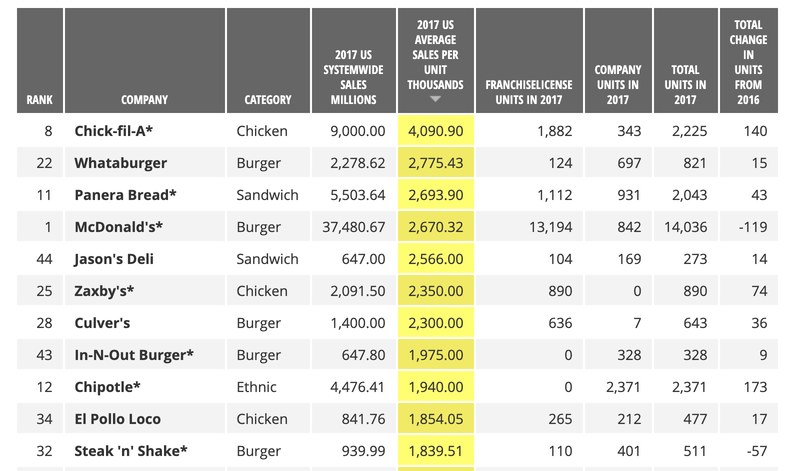 Currently, at $2M average sales per restaurant, Chipotle has some room to grow to get to the $2.5M level, which also happens to be the top unit restaurant sales level it reached during its prime in 2015. The closer it gets to the peak level, the more challenging it will be to expand further as each restaurant approaching its limit. It will only get harder from there. Another growth lever Chipotle can pull is to increase the pace of its store expansion, including international expansion. However, the pace of Chipotle's restaurant expansion has been slowing in recent years, limited by factors like capital requirements, lease terms negotiation, hiring challenges, and others. Evidently, Chipotle plans to open fewer restaurants in 2019. In its recent 10-K, Chipotle has projected to open 140 and 155 new restaurants, which is fewer than its historical average of restaurant expansion. This will likely have an adverse impact on its sales growth rate if the trend continues. Chipotle has not been keen on expansion through franchising because it wants to maintain control of the overall restaurant experience. That makes sense since the quality of food and restaurant experience is what set it apart from the other casual fast food restaurants. The downside is Chipotle can only expand at a moderate pace organically. Chipotle also believes the international expansion will be more difficult and costly than the U.S. market due to lower brand awareness and different consumer tastes in other countries as it outlined it in its 10-K. Specifically, due to lower consumer familiarity with the Chipotle brand, differences in consumer tastes or spending patterns, or for other reasons, sales at restaurants opened outside the U.S. may take longer to ramp up and reach expected sales and profit levels, and may never do so, thereby affecting our overall growth and profitability." All these factors will likely limit Chipotle's future growth at a moderate pace once the low hanging fruit is picked. Companies with perceived optionality for expansion into new verticles tend to merit higher earnings multiple for their growth potential. This used to be the case for Chipotle. However, such optionality appears to be gone with the recent closure of its other concept restaurants, leaving it with not many options for growth beyond the core Chipotle Mexican food business. Chipotle used to have attractive optionality to expand outside of Mexican food. Former CEO Steve Ells believed that the company's business model could be applied to other types of food. It was encouraging to investors when the company started testing other categories with Pizzeria Locale, ShopHouse Southeast Asian Kitchen, and Tasty Made based on Chipotle's successful model. If one of these concepts worked, it could meaningfully expand Chipotle's potential market and provide it with another powerful growth engine. Unfortunately, Chipotle admitted that ShopHouse and TastyMade were not able to achieve a level of sales and profitability that made them attractive for future investment, leading to their complete closure in 2017 and 2018. Chipotle also closed 5 Pizzeria Locale restaurants in 2018, leaving only two locations still operating in Denver, CO. Based on its 10-K, it is clear that management will not focus on Pizzeria Locale and other concepts, choosing instead to focus on the core Chipotle business. Here is a quote from 10-K that says it all. Notwithstanding our investment in Pizzeria Locale and exploration of other restaurant brand opportunities, our immediate focus will remain on thoughtfully growing the Chipotle brand. As a result, we do not expect Pizzeria Locale or other concepts to contribute to our growth in a meaningful way for at least the next several years." With the recent dramatic rise in share price, Chipotle appears to be more than fairly valued for its near-term growth prospect, making it ripe for profit-taking, which could lead to a short term pullback. 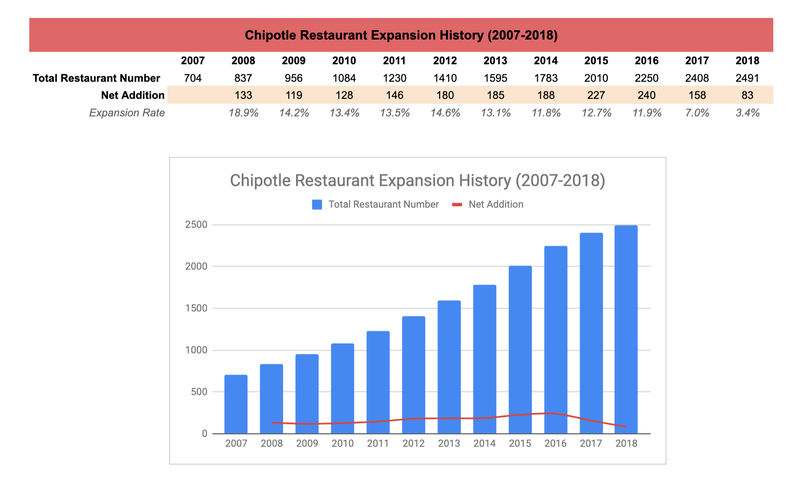 Assuming Chipotle can still grow at a mid-single-digit rate (5-7%) for same-restaurant sales, reaching $2.5-2.8M unit restaurant sales by 2023, and also maintain a steady pace to add 150 - 180 new restaurants per year, it can potentially grow its revenue to $8-9B, a moderate annualized growth rate of 11-14%. Also assuming Chipotle can achieve the profit margin of 10-12% that it reached during its peak back in 2015, we can expect Chipotle's net earnings to reach $0.8-1.2B level by 2023. With a moderate growth rate below 15%, it is hard to justify its current 57 forward P/E multiple. It is more reasonable, though still aggressive, to consider the forward P/E multiple at the mid-30s. With all these assumptions, a valuation model has produced a base case fair price of $660 (Bear case $458 and Bull case $819) after applying a 12% discount for a minimum acceptable rate of returns. Taking an additional discount of 50% for margin-of-Safety, the base case margin-of-safety price is $330 (Bear case $229 and Bull case $410). The current share price of over $700 is above the base case fair price but still under the bull case fair price. Nonetheless, it is certainly richly valued with aggressive expectations. Such rich valuation implies the market has already priced in most of the growth drivers with a very high expectation. This means future price appreciation will increasingly be more difficult and will likely follow a choppy pattern rather than going straight up. When facing a moderate growth prospect and a rich valuation, investors will need to evaluate if they have better alternatives with higher growth velocity and better price. In other words, are they willing to accept the opportunity cost? With a roughly 15% annual growth prospect for the next several years, Chipotle may be a less attractive investment option for a growth investor. With its rich valuation, it is also less attractive to a value investor. 15% growth is still respectable, nothing to sneeze at. However, with the already rich valuation, whether the share price will keep up the pace is increasingly uncertain. Adding the opportunity cost consideration, investors may want to take a pause and consider their alternatives. In 2018, Chipotle has done a great job to identify and implement initiatives that have returned the business to a growth mode. However, it will be increasingly more challenging to achieve higher growth as the obvious quick turnaround options have been implemented, leaving the company with less certain options for future growth. The management decision to exit other concept businesses has greatly reduced Chipotle's optionality, making significant marketing expansion less likely in the near future. Coupled with the rich valuation and opportunity cost, investors should take time to reevaluate the role of Chipotle's stock as part of their investment portfolio strategy. Just to be clear, I am not bearish on Chipotle's business prospect. On the contrary, I believe Chipotle still has a decent runway for growth at a moderate pace. I just want to point out that the recovery story may have largely been played out and the current share price has mostly priced in the known growth drivers. Investors have been rewarded with 180% returns since the Feb 2018 low of $250. From this point on, Chipotle's share price appreciation will largely depend on the organic growth that it can actually generate, which will likely be moderate. In other words, the meteoric rise of Chipotle's share price may be over soon, replaced with a more moderate growth prospect and potentially even a short term pullback for any perceived negative news. Long term investors who still believe in Chipotle's growth story can continue to hold the stock but may want to reset their expectation. Growth investors who have other investment options with higher velocity for growth may want to consider trimming some of their Chipotle holdings and shift the proceeds to these better alternatives. Of course, the market can remain exuberant for much longer and reward Chipotle with even richer valuation after its upcoming quarterly earnings report. But is that a rational investor should count on? I am sure we all have our own answers.